CHPC director Charlotte Waddell (adjacent), delivered the closing plenary address on the topic, “Improving Children’s Mental Health: The Policy Opportunities in Canada.” In her 50-minute presentation, Waddell covered a host of topics for the broad-ranging audience that included everyone from well-known academics to graduate students. • It’s important not to focus on one age group at the expense of others. The responsibility facing children’s mental health policymakers encompasses all young people from before birth to early adulthood. • There are considerable challenges in providing services for all ages and all disorders. “We are currently reaching only 30% of children with mental health disorders,” Waddell said, citing a recent systematic review the CHPC prepared. • We need to triple spending on children’s mental health. “That goal is entirely reasonable,” according to Waddell. She adds that new spending should cover both prevention and treatment, and should go towards effective or proven interventions. 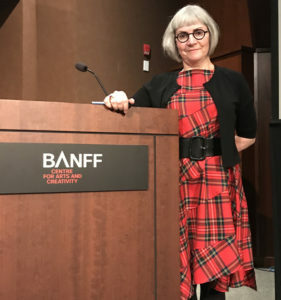 Earlier in the conference, the CHPC team also delivered a three-hour workshop titled, “Research-policy partnerships in children’s mental health: Lessons from British Columbia.” In it, Nicole Catherine spoke about her experience as Scientific Director and Co-Principal Investigator of the BC Healthy Connections Project, the first Canadian randomized controlled trial evaluating the Nurse-Family Partnership (NFP) program. Developed nearly 40 years ago by David Olds and colleagues in the US, NFP starts in early pregnancy, before children are born, and involves intensive home visits continuing until children reach their second birthday. The program particularly focuses on girls and young women and their children who are facing disadvantages such as low income. The BC Healthy Connections Project trial involves close collaborations with BC policymakers in the Ministries of Health and Children and Family Development and in four participating regional Health Authorities. Some 744 children are being reached through the trial, with final results expected in 2020–2021. In the same workshop, Christine Schwartz spoke about the Children’s Mental Health Research Quarterly, describing a longstanding research-policy-practice partnership with BC’s Ministry of Children and Family Development. She highlighted the methods used to convey research evidence to policymakers, as well as to practitioners and families. These methods include preparing systematic reviews of evidence on prevention and treatment interventions across a wide array of childhood mental health problems. Evidence is then prepared in user-friendly formats, published free on line, in the Quarterly. Topics are chosen in consultation with policy partners and each issue is accompanied by talks. Worried about a child or youth in your care? Contact your local Child and Youth Mental Health clinic.